About the SCTE - Broadband industry trade association. Founded in 1945, the SCTE is constituted as a Learned Society and is registered as a non-profit making organisation. The Society is run by an Executive Committee whose members, all volunteers, are elected for a term of three years at the Society’s Annual General Meeting. The Executive Committee elects three officers; a President, Vice-President and Treasurer who also act as trustees for the Society. The Society has a small secretariat and is based in its own offices in Watford, UK. The Society has active organisations in Benelux, the Balkans and India. The SCTE holds lecture meetings six to seven times per year, in the UK (mainly London), in the Balkans and through its Benelux Group at selected European venues including IBC in the Netherlands. The Society also organises events, including gala dinners, to enable members to meet and exchange views of the industry in a social environment. As a Learned Society, SCTE is able to provide accreditation and certification for its members, giving them professional standing within the industry. Full Members and Fellows are allowed to use the designations MSCTE and FSCTE after their names. Technician and student members are allowed to use the designationsTMSCTE and SMSCTE respectively after their name. The SCTE provides a wide range of training courses which have gained wide acceptance as the standard for young technicians wishing to enter the field of cable telecommunications and for those wishing to advance their knowledge and career prospects. They are used in-house by a number of operating companies and SCTE engineers can be found working in a variety of international organisations. The Society chairs the British Standards Committee for cable systems and represents the UK at European (CENELEC) and world (IEC) levels. The Society particularly concerns itself with the training and career advancement of technical professionals in the field. The SCTE also provides accreditation and certification for its members, giving them professional standing within the industry. The SCTE also stages lecture meetings three to four times per year, mainly at One Great George Street in London, in the Balkans and through its Benelux Group at selected European venues including IBC. The Society chairs the British Standards Committee for cable systems and represents the UK at European (CENELEC) and world (IEC) levels. Before you tire of reading my message, I am going to start with an appeal. It is my desire that, during my term as President of our Society, we work together to continue the excellent progress that our outgoing President, Mike Thornton has made, in improving the relevance of the SCTE to new and younger members of the Broadband Communications Industry. You are probably aware that the SCTE has a shareholding in IBC (International Broadcasting Convention), an organisation that delivers an annual congress and exhibition in Amsterdam and offers a series of technical presentations and a forum for discussion between delegates, mostly drawn from the broadcasting industry. The very best SCTE membership experience. Securing the future of our Society. Further developing our altruistic investment in world class technical training. Our Society has Executive Committee members who represent you and are your voice in discussions about how the Society plans its future. Please help me by contacting one of your SCTE Executives and sharing your ideas and views with them; they all have a contact page on the SCTE website (see SCTE Structure). I want to be fully engaged with our members and certain in the knowledge that we are making the right decisions that will fulfil my three key objectives. The SCTE website offers a two-tiered level of access, one for general public use and the other with content accessible only with a SCTE member’s password. If you have never visited the SCTE website, or have not been there for a while, I believe you will be pleasantly surprised by the quality and detail of the content available. Information about our Society’s structure, technical training, copies of lecture day presentations and a wealth of SCTE archive material are just some of the items you may enjoy. The SCTE continues to be active on the international broadband communications stage and has a highly successful SCTE Benelux Group that delivers an increasingly popular, bi-annual lecture meeting and an Annual Gala Dinner. Also, our SCTE India Group participates in regional exhibitions, is developing training modules and has gradually become established to the point where, this year, it is now controlling its membership-related administration. We have an SCTE Ambassador in the Balkans where, as a result of regional training and trade exhibitions, new members have been successfully recruited. This initiative is being somewhat mirrored in Turkey, where the SCTE is working to develop training tailored to the needs of the national broadband network operator. A valuable benefit of belonging to the SCTE is the opportunity for members to apply for a bursary to attend one of a number of exhibitions that have, in the past, included ANGA COM, IBC, the FTTH Conference and DVB World. The bursary covers the cost of flights, hotels and subsistence. The consistently popular and well-attended SCTE lecture meetings attract world-class international speakers from industry-leading vendors, universities and industry standards groups, with some of the presentations available on the SCTE website as offline webcasts. The lecture meetings often provide the catalyst for some of the excellent papers published in SCTE’s Broadband Journal, a high-quality publication that is admired and respected throughout the broadband communications industry. The complete range of SCTE training courses has been updated and is available, along with textbooks by the SCTE Broadband Training Group which now operates as a distinctively branded part of SCTE Ltd. under the direction of the Executive Training Committee. The SCTE Annual Gala Dinner and Awards Ceremony has always been a well-attended and often “sold out” event. The SCTE Awards are made to well-deserving members and those vendors who have showcased outstanding technology or innovative products that the SCTE Executive Committee chooses for special recognition. Finally, in closing this message, I would like to thank your SCTE Executive Committee who has elected me to the position of President, and assure you that I will do my best for you and our Society. The Society was originally founded in 1945 as the Society of Relay Engineers, a forum to exchange views and information about radio relay services following World War II. Following the introduction of cable-delivered Television in the early 1950s, it became the Society for Cable Television Engineers and thus the acronym SCTE. After the duopoly review in the 1990s, when Cable operators started to provide telephony services, the name was changed to the Society for Telecommunication Engineers and finally, with the introduction of broadband and WiFi, to the Society for Broadband Professionals. The Society has a substantial archive of material relating to its foundation and ongoing history. On the occasion of its 50th, Golden Anniversary the Society produced a brochure detailing the early years and its development up to 1995. This was supplemented in 2005 by an updated version on the occasion of its Diamond Anniversary. Both of these documents are available for download together with a sample of early archive material relating to the foundation of the Society. A more comprehensive archive of correspondence and relevant material on the founding of the Society is available for reference to Members of the Society, and, of course, the development of the Society through subsequent years can be followed by accessing the complete set of Society Journals covering 1945 to date. The Society chairs the British Standards Committee for Cable Systems and represents the UK at European (CENELEC) and world (IEC) levels. SCTE members are therefore regularly provided with worldwide standards update through the SCTE’s Broadband Journal and UK members also have the opportunity to comment on standards development, within the UK, through the SCTE before they are finalized in Europe. A full Technical Specification and Standards section, for SCTE members only, can be found in the Members Handbook or in the link below. Read SCTE’s latest Standards Update to members. 1) What is the SCTE? The SCTETM (Society for Broadband Professionals) is a not-for-profit professional body for all broadband engineers and technicians worldwide. As a learned non-profit Society, it provides accreditation and certification for its members, giving them professional standing within the industry. 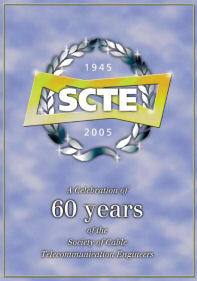 SCTE was founded in 1945 and has individual and corporate members all over the world. It will be celebrating its 75th Anniversary in 2020. 2) What do you do? What part of the telecoms market do you operate in? The SCTE’s main aim is to advance the level of knowledge and standing of its members within the industry. Although its pedigree comes from the cable TV arena, its remit also covers delivery of content over the ‘last mile’; including coax, twisted pair, wireless and fibre. This is achieved by arranging a variety of networking events (technical lecture meetings, conferences, exhibitions etc.) and by disseminating the latest technical and standards data to its membership electronically and in its highly regarded quarterly magazine, Broadband Journal. The Society chairs the British Standards Committee for Cable Systems and represents the UK at European (CENELEC) and world (IEC) levels. 3) Where are you based and how widespread is your organisation globally? The SCTE headquarters are in Watford, UK, but the Society has active groups in other regions, notably in India and in the Benelux and Balkan regions. Individual members can be found in 42 countries worldwide with a concentration in traditional ‘PAL’ TV areas; Europe, Hong Kong, Australia and South Africa. SCTE training courses, for distance learning or instructor-led use, have achieved wide acceptance as the standard for young technicians wishing to enter the field of broadband telecommunications. Courses are also used in-house by many international operating companies and SCTE instructors can be found working with aspiring engineers in organisations around the world. Over 7,000 students have achieved accreditation over the past 10 years. 4) Why is your organisation important? The core skills and knowledge needed for a successful career in the industry are seldom taught formally in higher education. The SCTE provides the opportunity for learning through training, seminars, exhibitions and networking as well as a membership structure through accreditation. It also provides a forum for the international exchange of ideas through a variety of networking events worldwide i.e. technical lecture meetings, conferences, exhibitions, dinners, golf and track days etc. The Society also runs its Annual Dinner and Awards event, where excellence in the broadband industry is rewarded. It also provides bursaries for technicians and engineers. 5) Who are your members? The Society has a wide and diverse membership; professional grades are available for those with training and experience whilst those with an interest in the industry or just starting their career are covered by associate and student grades. Members also have the option to upgrade their membership to ‘Fellow’ status after two years. The SCTE also has a corporate membership for companies wishing to support and be involved with its mission. 6) What are the benefits of SCTE membership? Members receive free admission to all SCTE lectures and seminars as well as receiving our quarterly technical publication ‘Broadband Journal.’ The Society’s networking and social events are highly subsidised, making them affordable to all grades of membership. The grading and accreditation structure provides evidence of professional standing and members may use post-initials on their business cards and stationary. Membership of the SCTE also comes with an impressive range of member’s discounts to attend key industry exhibitions and events worldwide i.e. CommunicAsia, IBC MENA Content Everywhere etc. Members also benefit from discounts on advertising, training, business stationery, industry market research and specialist PR packages. Members can network directly with each other as well as via SCTE meetings and events. All members are eligible to apply for SCTE bursaries as well as nominate products and technologies for SCTE industry awards. 7) Why should companies/individuals choose to join your organisation rather than one of the other professional bodies? We concentrate on the skill-sets and technology relevant to the Broadband Industry. We are primarily an institute for individuals rather than a trade organisation. The SCTE is a truly global organisation with members in over 42 countries. 8) Are you the same organisation as the US SCTE? No, we are a much older, independent organisation originating in Europe in 1945. We have similar aims but are constituted slightly differently. We have a long history of cooperation but are financially and organisationally separate entities. 1 The Society shall be known as The Society of Cable Telecommunication Engineers (hereinafter called ‘the Society’). For descriptive purposes the Society may be called The SCTE, The Society for Broadband Professionals. (a) To raise the standard of broadband telecommunication engineering to the highest technical level which may from time to time be practicable. (b) By co-operation among the members and by the specialised knowledge and experience of individual members, to elevate and improve the status and efficiency of those engaged in broadband telecommunication engineering and in particular, of those engaged in that profession who are members of the Society. (c) To afford to those who may be elected as Members, Associate Members and Technician Members of the Society the opportunity, through the activities of the Society, to obtain the necessary experience and education to attain the higher levels of membership of the Society. (d) To hold meetings of the Society for reading and discussing communications bearing upon broadband telecommunication engineering or its applications. (e) To hold or promote exhibitions of instruments, apparatus, machinery or other appliances connected with broadband telecommunication engineering or its applications. (f) To print, publish, sell, lend or distribute the proceedings or reports of the Society, or any papers, communications, works or treatises on broadband telecommunication engineering or its applications, or subjects connected therewith, or any abstracts thereof, or extracts therefrom. (g) To make grants of money, books, apparatus, or otherwise for the purpose of promoting invention, education and research in broadband telecommunication engineering, or its applications, or in subjects connected therewith. (h) To provide and accredit training courses for the advancement of technical skills and knowledge within the broadband industry. (i) To organize events, dinners and awards ceremonies in order to promote the Society and afford social and networking opportunities for the members. (j) To do all other things incidental or conducive to the attainment of the said Objects and purposes. 3.2 Detailed qualifications for membership in each category shall be set out in Society’s application for membership form. In addition to the eight membership categories defined in 3.1(a) to (h), the Society may seek to appoint a Patron of the Society. The role of Patron is to represent the Society at the highest level within the Broadband Telecommunications Industry, the Government and regulatory bodies throughout Europe. The post is elected, titular, non-executive and subject to initial appointment, annual review and renewal by the Executive Committee. b) If a member leaves membership, the SCTE will only store their data for as long as it needs to be able to process any complaints arising within 12 months of membership ending. Any person who is in practice as a Broadband Telecommunication Engineer and who, at the time of his candidature, has attained a standard of efficiency and experience commensurate with that contemplated by the Society and who, at the time of his candidature has been a Member for not less than two years and who in other respects is deemed to be a fit and proper person for election, shall be eligible as a Fellow if approved by a majority of those present and voting at a Meeting of the Executive Committee of the Society. Fellows of the Society may use the post-initials FSCTE. Any person, including those mentioned in sub-clauses 6 (a) – (d) inclusive (not having interests conflicting with those of the Society), may at the discretion of the Executive Committee become an Honorary Fellow of the Society. Honorary Fellows of the Society may use the post-initials FSCTE. Any person whose qualifications are appropriate to Fellowship, or being a specialist in some particular branch or branches of the broadband telecommunication industry, has not attained the general efficiency and experience contemplated as a qualification for Fellowship shall, subject to his candidature being approved by a majority of those present and voting at a Meeting of the Executive Committee, be eligible for election as a Member. Members of the Society may use the post-initials MSCTE. Any person who, while not qualified for election as a Fellow or a Member but who has entered the broadband telecommunication industry in a technical capacity and is desirous of benefiting from the opportunities afforded by the Society for improving his knowledge of broadband telecommunication engineering shall, subject to election in manner herein before provided, be eligible for membership as a Technician Member. Technician Members of the Society may use the post-initials TMSCTE. Any student in a further education course designed for a future career in the broadband telecommunication industry shall be eligible for admission as a Student Member, subject to his candidature being approved in manner herein before set forth. Student Members of the Society may use the post-initials SMSCTE. Any person who has attained a reasonable standard of general education and who has entered the cable telecommunication industry in a general capacity, shall be eligible for admission as an Associate Member, subject to his candidature being approved in manner herein before set forth. Associate Members of the Society may use the post-initials AMSCTE. Any Society, Institution or Trade Association whose interests coincide with those of the Society, and with which a reciprocal arrangement can be negotiated for publication rights, shall subject to approval of a majority of those present and voting at a meeting of the Executive Committee, be eligible for election as an Affiliated Member. Any organisation engaged in any aspect of broadband telecommunication shall, subject to the approval of a majority of those present and voting at a meeting of the Executive Committee, be eligible for election as a Corporate Member. For those engaged in installation work the principal or at least one employee must be a Member or Fellow of the Society. 5.1 Every member in any category shall on his first becoming a member and also on every subsequent First day of April pay the Annual Membership Fee appropriate to membership of his category. This fee to be in accordance with the scale determined from time to time by the Executive Committee. 5.2 Any member of one category on being admitted as a member in a different category shall pay the difference between his Annual Membership Fee and the Annual Membership Fee payable by him as a member of such new category if the latter is of a greater amount. 5.3 The Executive Committee may from time to time increase or reduce the amount of the Annual Membership fee payable by members of any category or require the payment of Entrance Fees by persons admitted to membership in any category, in addition to the Annual Membership Fees, and may also in its absolute discretion waive payment wholly or in part of Entrance Fees and Annual Membership Fees in any case or cases where it may think fit so to do. 5.4 In addition to the Annual Subscriptions payable by members under this Constitution, the Executive Committee has the right to call upon members to contribute to the funds of the Society such additional sum or sums as may be necessary, up to a maximum of £100, to meet any exceptional or unusual expenses incurred or intended to be incurred by the Society. 5.5 A Member or Fellow of the Society, having been in membership of the Society for at least 10 years, and who has reached the Statutory Retirement Age, shall be eligible to apply for life membership of the Society for a single payment. The amount of such payment shall be fixed by the Executive Committee. (a) If his annual membership fee is in arrears for three months. (b) If a Receiving Order is made against him, or if he makes an arrangement or composition with his creditors. (c) If he resigns by giving three months’ notice in writing to the Society and at the time of giving such notice pays all fees due. Notice of resignation received within three months of the First of April in any year shall not relieve the member giving the same from payment of his annual subscription fee payable on that date. (d) If he, in the opinion of the Executive Committee, ceases to be actively engaged in activities which, in accordance with the Constitution, are the qualifications necessary to enable him to be a member of the particular category in which he then stands. (e) If the Society decide by a majority of three-fourths of those present and entitled to vote at a General Meeting of the Society and after investigation and giving the member an opportunity to be heard, that such member has been guilty of discreditable conduct, or of conduct prejudicial to the interests of the Society and that by reason thereof he be excluded from membership. 6.2 Any member who fails to pay his annual membership fee within the month from the first day of April in any year shall, at the discretion of the Executive Committee, as from the end of that month be suspended, pending payment thereof, from all rights and privileges of membership. 7.2 No person shall be eligible to be an Officer of the Society unless he be a Fellow or Honorary Fellow. At the Executive Committee Meeting following the Annual General Meeting, Officers of the Society shall be elected for a maximum period of three years to align with their elected term of office but shall be eligible for re-election. The election of Officers shall be by means of secret ballot to be conducted as may be prescribed from time to time by the Executive Committee. No member shall vote upon the election to an office for which he is candidate but shall be entitled to vote in respect of any other office. 7.3 The Officers of the Society shall also be the Trustees of the Society and shall be empowered to sign such legal and other documentation which may from time to time reasonably become necessary on behalf of the Society and the Executive Committee shall be authorised to agree the terms of and execute a Trust Deed appointing the Officers as Trustees in order to satisfy this clause which shall include such limitations on the Trustees powers and liabilities as the Executive Committee deem fit. 8.1 Where any decision is to be made by the Executive Committee within their powers in the Constitution or as expressly stated in this Constitution or any rules and regulations adopted by the Society then that decision is to be made by a majority (or by some other percentage of votes if expressly stated as a requirement for that decision) of the elected members of the Executive Committee and any reference in this Constitution to the Executive Committee where it refers to a decision of the Executive Committee shall be construed as meaning a decision of the elected members of the Executive Committee. 8.2 The Officers collectively, together with not less than four other Fellows or Honorary Fellows shall constitute the Executive Committee of the Society. Election to the Executive Committee shall be nominally for three years in rotation, with elections for vacancies conducted at Annual General Meetings. Retiring members shall be eligible for re-election. For vendor groups, a maximum of two representatives would be allowed on the Executive Committee at any one time and for MSOs, the maximum allowed would be five representatives. 8.3 Subject to the overriding authority of the Society in General Meeting the affairs of the Society shall be conducted by the Executive Committee, who may meet at such time and place as they think fit and whose business shall be conducted in such manner as they may from time to time determine, and their decision on interpretation of the Society’s Constitution or Rules shall be binding on all Members of the Society, subject as hereinafter stated. 8.4 Any decision of the Executive Committee may be revoked or overruled by the vote in General Meeting of a majority of not less than two-thirds in number of all Fellows and/or Honorary Fellows and/or Members for the time being entitled to attend and vote at a General Meeting. 8.5 Any vacancy occurring among the Officers or other members of the Executive Committee between one Annual General Meeting and the next may be filled by the remaining members of the Executive Committee, but any person so appointed shall hold office only until the next Annual General Meeting, when he shall retire but shall be eligible for re-election. 8.6 Any Executive Committee member who is absent from two Executive Committee Meetings in any 12-month period may be required by the appointed officers of the Society to seek re-election at the next occurring Annual General Meeting. The reason for seeking re-election shall be noted on the notice to Members. 8.7 Notice of vacancies occurring for the following term shall be communicated to members in writing at least 8 weeks prior to the AGM together with a request for nominations suitably proposed and seconded by two separate Fellows, Honorary Fellows or Members of the Society save that such communication may be given by electronic mail for members that have elected to receive communications by electronic means. Nominations must be received within 3 weeks of the date of the original communication. The Executive Committee shall have the right to appoint up to four additional ex-officio members of the Executive Committee whose specialist skills or position are seen to be beneficial to the running of the Society. 10.1 Sub-committees may be formed and such powers delegated to them as the Executive Committee may from time to time determine. 10.2 All Officers of the Society shall be ex-officio members of any sub-committee so formed as aforesaid. The power of appointment, remuneration and general terms of employment of a Chief Executive and/or Director shall be vested in the Executive Committee. The Executive Committee shall have authority to engage a Secretary and/or other staff. 13.1 The Annual General Meeting of the Society shall be held at such time as the Executive Committee shall decide and at such time and place as the Executive Committee may appoint by giving to all members twenty-eight days’ notice in writing save that such notice may be given by electronic mail for members that have elected to receive communications by electronic means. 13.2 At Annual General Meetings the Executive Committee shall submit for consideration their Report on the affairs of the Society and the past year’s transactions, together with the Accounts made up to 31st December of the preceding year, signed by the President and the Treasurer. The above business and the election of Auditors and members of the Executive Committee shall be the ordinary business of an Annual General Meeting unless it shall have been specifically referred to in the Notice convening the meeting or shall be certified in writing by the Officers of the Society to be a matter of extreme urgency. 13.3 Should the Executive Committee fail to convene an Annual General Meeting as herein provided and in accordance with statutory requirements, any ten Fellows and/or Honorary Fellows and/or Members shall be entitled to convene such meeting upon giving not less than twenty-eight days’ notice in writing to the members of the Society save that such notice may be given by electronic mail for members that have elected to receive communications by electronic means, and such meeting shall be held in London at such place and time as the convening members shall appoint. The cost of convening and holding such meeting shall be borne by the Society. 13.4 Notice of Special Resolutions for consideration at Annual General Meetings must be given in writing to the Secretary not less than thirty-five days before the date fixed for an Annual General Meeting. 13.5 Details of any special resolutions received together with details of any candidates standing for election to the Executive Committee shall be given in writing to all members four weeks in advance of the meeting save that such notice may be given by electronic mail for members that have elected to receive communications by electronic means. 14.1 The Executive Committee may convene an Extraordinary General Meeting and shall, upon a Requisition signed by at least ten Fellows and/or Honorary Fellows and/or Members, convene an Extraordinary General Meeting within twenty-eight days of the receipt of the Requisition and every notice convening the Extraordinary General Meeting shall specify the general nature of the business to be dealt with at such meeting and not less than seven days’ notice in writing shall be given to all members entitled to attend at General Meetings save that such notice may be given by electronic mail for members that have elected to receive communications by electronic means. 14.2 If the Executive Committee do not proceed to cause a meeting to be held within twenty-eight days from the date of the Requisition being so given as herein mentioned, those requesting the Requisition or any ten of them may themselves convene the meeting in the manner herein prescribed for the convening of Extraordinary General Meeting, but the notice shall inform members of the circumstances rendering that course necessary. The cost of convening and holding such a meeting shall be borne by the Society. 15.1 All members of the Society of whatever category shall be entitled to receive notice of and to attend at General Meetings of the Society, subject as hereinafter stated. No member other than a Fellow, Honorary Fellow or Member shall be entitled to propose or second a Resolution or to vote upon any such Resolution. If at any General Meeting a Resolution is duly passed by majority of the Fellows, Honorary Fellows or Members that any class or classes of other members shall retire then such members shall so retire and remain absent until such specified business has been concluded. 15.2 Associate Members, Technician Members, Student Members, Affiliated Members and Corporate Members may take such part in the proceedings of a General Meeting as may be permitted by the Chairman of the Meeting. 15.3 The President, if present, and failing him the Vice-President, shall preside at all General and Executive Committee Meetings of the Society. If neither be present, the Chair shall be taken by such Fellow or Honorary Fellow as may be elected for that purpose at that Meeting. On occasions judged by the Executive Committee to be practicable, Postal and Proxy voting facilities shall be made available to entitled members, excepting that Postal and Proxy voting facilities shall be afforded for the ordinary business of an Annual General Meeting and for the Winding-Up of the Society. Such voting facilities may be provided by letter or by electronic mail for members that have elected to receive communications by electronic means. Details of the Proxy voting facility shall be published at least 4 weeks prior to the event. The Secretary shall set a deadline for postal or proxy voting applications up to 1 week before the notified event. A Quorum for a General Meeting shall be ten Fellows and/or Honorary Fellows and/or Members present in person. (a) Power to raise funds and to invite and receive contributions. (b) Power to buy, sell, take on lease or in exchange, any property, and to maintain and equip it for use. (c) Power to sell, lease, or otherwise dispose of, all or any part of the Society's property. (d) Power to borrow money and to mortgage all, or any part of the Society's property, as security for repayment of the money borrowed. (e) Power to set up and operate limited liability companies to assist in the achievement of the Objects providing that all profits generated by such companies are remitted to the Society. (f) Power to invest the funds of the Society in any of the investments for the time being authorised for the investment of trust funds. (g) Power to exercise the voting rights of SCTE shares held in subsidiary companies. The voting rights for the shares owned by SCTE shall be exercised by a majority decision of the Executive Committee and in the event of a split decision, the Chair of the meeting of the Executive Committee at which the vote is taken shall have the casting vote. (h) Power to do all such other lawful things as are necessary for the achievement of the Objects. (a) Of the sums of money received and expended by the Society and the matters in respect of which such receipts and expenditure take place. (b) Of the property credits and liabilities of the Society. 19.2 The books of Accounts shall be kept at the Office or at such other place as the Executive Committee think fit and shall always be open to the inspection of the members of the Executive Committee at that place. 19.3 At the Annual General Meeting in every year, the Executive Committee shall lay before the Society a statement of income and expenditure made up to the 31st December of the previous year, and a Balance Sheet to the 31st December containing a general summary of the assets and liabilities of the Society arranged under suitable headings. 19.4 Every such Balance Sheet shall be signed on behalf of the Executive Committee by the President and the Treasurer and shall be accompanied by the Report of the Executive Committee as to the state of the Society’s affairs and upon the last year’s work of the Society. Bank accounts shall be maintained and operated in the name of the Society as prescribed from time to time by the Executive Committee. The opening and closure of such accounts shall be at the discretion of the Executive Committee. Auditors of the Society shall be appointed at each Annual General Meeting, who shall certify and shall report on the Accounts, and a copy of such Report shall be inserted at the foot thereof and submitted to the Annual General Meeting at which such Accounts are presented. If any prosecution, action or suit at law be commenced against any Officer or the Secretary or any other servant or agent of the Society, for anything done by him in proper and reasonable discharge of his duty, such person shall be defended and indemnified by and at the cost of the Society from all damages, costs and expenses which may be incidental to or result from such prosecution, action or suit at law, and the Executive Committee are hereby empowered to apply the property and funds of the Society for such purpose. (c) In the event of it being required to wind-up the Society for reconstruction or amalgamation, then the funds of the Society shall be disposed of in such manner as the majority of Fellows, Honorary Fellows and Members present and voting may decide. 24.1 The income and property of the Society shall be applied solely towards the promotion of the Objects and the Society shall not engage in any trade or business or transaction with a view to the pecuniary gain or profit of the members thereof. No member shall have any personal claim on any property of the Society and no part of the income or property of the Society shall be paid or transferred directly or indirectly by way of dividend or bonus or other direct payment to the members of the Society except in the case of and as a salaried employee of the Society. (a) The payment by the Society in good faith of reasonable and proper remuneration to any member of the Society as an Officer or servant of the Society or to any such member in return for any services rendered to the Society. (b) The payment by the Society of interest at a rate equal to the published base lending rate of the Society's bankers per annum on money lent to the Society by any such member or reasonable and proper rent for premises demised or let by any such member to the Society. (c) The giving by the Society to any such member of prizes whether in cash or otherwise and scholarships and exhibitions. (d) The payment to any member of the Executive Committee of reasonable out of pocket expenses, such expenses to be fully documented. and the Society shall have power to make all such payments and gifts as aforesaid. No modification of or addition to this Constitution shall be made unless notice calling a General Meeting and intimating the proposed modification or addition shall be given to the members, and such modification or addition shall have been approved by the majority of not less than three-fourths of the Fellows, Honorary Fellows and Members present.